This is going to be the hardest review I have ever written. Why? Because I know that even the slightest comment may be considered a spoiler and the one thing you should know before going in is that the less you know, the better the experience. This is what this film is, an experience. If you have invested the time of the past 10 years on everything that Marvel has produced, this is like receiving a huge party on your birthday: joyous, emotional and full of surprises. Thanos has decided the time is right to collect the Infinity Stones, six gems that have been scattered around the universe. Each one with a power but together, they create an unstoppable force. In order to stop Thanos, the Avengers and their allies must be willing to sacrifice all before this monster can get his hands on those precious stones. 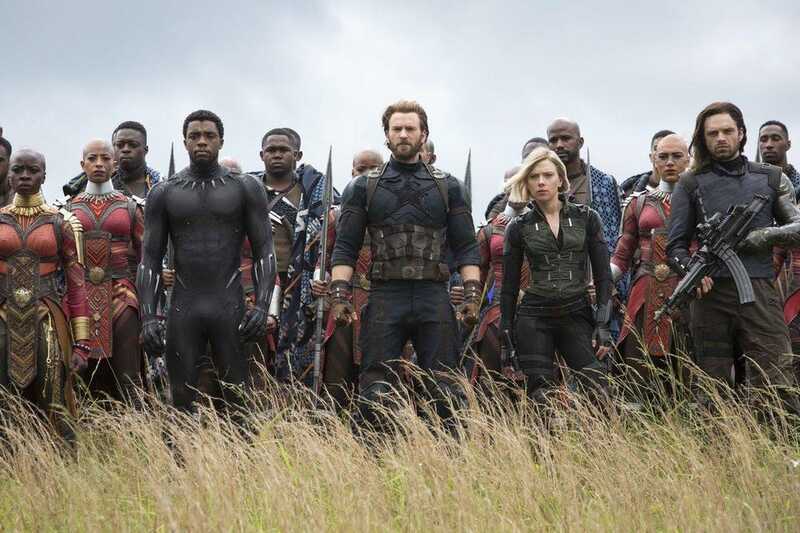 Ever since the first Avengers movie, Thanos has been a presence in the background. Now he is front and centre and if anything, it will need the collective strengths of the heroes that we, the audiences, have been enjoying over those past 10 years. With the directors of the past two Captain America films now in charge (since Joss Wheldon jumped over to D.C), they have pulled together all those characters that we have grown to love. The Russo brothers have to juggle a mass of superheroes from all corners of the universe, whether they be Earth-bound or from space. So we have the Avengers fighting side by side with The Guardians of the Galaxy, or Doctor Strange is working with Iron-Man. You get the picture. In order that everyone seems to be getting equal screentime, the story shifts from one part of the world to another to different planets. For all their hard work in keeping the collective characters equal, some do get less screen time than others while some become blinks and they are gone. From the outset, the Russo set their stall up and basically in the first few minutes, you know you are not going to have an easy ride. You are going to be put through the wringer emotionally. At the same time, you are going to laugh a lot, cry, gasp and, if you were like me, almost whoop with joy. There are scenes that will make your heart race, there are scenes that will shock. It is a huge roller coaster ride and one that I never wanted to stop. Then came the finale and the jaw dropped. It then becomes really apparent that the ending is only Act One and we have to go through this all over again next year when Avengers 4 comes out (no title yet). Avengers: Infinity War is the Marvel movie the fans have been waiting for. A smash-em, grab-em romp that, at 2 hours 30, zips through at a tremendous pace, never given a moment to be bored. It is epic on an epic scale. And it is a blast! P.S: As with all Marvel movies, stay until the very end for the one extra scene that delivers more surprises.